Here you can find information profiles on some of our athletes, covering from their weight and height to why they started rowing and what USBC has given them. I started rowing in September 2018 when I moved to University of Surrey. I had absolutely no intention of taking up the sport but it has honestly been the best decision I have made. I have been apart of sports teams from gymnastics and netball from a young age but there is no sense of togetherness like there is within rowing. The early starts and the intensity of the training has been extremely challenging and pushed me to my limits but the progress I have made in such a short time is 100% worth missing the minutes in bed! The culture that is involved within the rowing club is truly special and I am surrounded by such a great support system where anyone who faces their lows is immediately picked up; whether that be by team mates, the other squads or the coaches and it feels empowering to know you have that guidance from peers and mentors. From starting in September, my teammates and I have just improved beyond what I could of believed and each time we come off the water we are more excited about the upcoming racing events. The training is intense and the sacrifices that you make are apparent but when you get into the boat and race with the girls you’ve formed such strong bonds with you immediately put into perspective what is important and I am so proud of myself and the incredible girls I am surrounded by. ‘I first started rowing this year in my second year at university. I originally never considered rowing as a sport I was going to do at university. I have tried a lot of different sports over the years spanning from judo to American football and even ultimate frisbee but none have come close to the experience I’ve had whilst rowing. Rowing is no easy sport and comes with a lot of physical and mental pain and definitely comes with a lot of highs and lows. From the early morning sessions before lectures to the blistered hands; countless hours spent erging and on the water, all make for a distant thought as I’m now sat here with three wins, a BUCS gold medal and a HoRR pennant. ‘I joined USBC 6 months ago as a Beginner, not really knowing if I would like the sport or even if I would be up to the challenge. From the get-go I was pushed to my limits and I absolutely loved that. Not only have I got fitter and stronger, but I have found a sport that challenges and pushes me to places I didn’t think I could reach. So far, I have competed in four races, and our beginner women’s 8+ is currently 4th in the country. Our training recently is in aid of moving that up to 1st place, and we can’t wait to show the rest of the country what we can do. ‘I started rowing in September 2014 at See-Club-Zug in Zug, Switzerland. I joined because I wanted to improve my German and do some exercise. Within a few weeks I was addicted to the sport and loved being out on the water. I started racing sculling boats, lots of quads and doubles. Later in the season I switched to sweeping and competed in the U23 8+. September 2015, I started at the King’s Hospital School Dublin, and competed at several high-level junior rowing events in Ireland. During the holidays, I raced for See-Club-Zug and when I moved back to the UK, I rowed for Henley Rowing Club. I was immediately welcomed by USBC and they had such a good environment. There’s great balance of high performance and fun. Coach Tuck has given me opportunities to push myself to the next level. ‘When I came to Surrey University, I had no strict desire to join rowing, yet here we are 7 months down the line with four wins, two BUCS national gold medals, a Head of the River pennant and a group of some of the best lads I’ve ever met. It’s been an experience, to say the least. There have been many highs and many lows, but joining the team, even be it by a stroke of luck, has been the best decision I have made whilst being at University. I can’t imagine not being a part of the club. I love the way in which everybody is there to push themselves to the absolute limit, going to lectures and then returning the next day to do the same again. I really love being part of a squad which is passionate and focused on performance. ‘I started rowing at USBC and my beginner year was incredibly fun. I’d always considered picking up rowing due to my height but I never got the opportunity. So when I got to University, I knew it was something I wanted to try. I was instantly hooked and I can’t imagine not doing it now. My first year was very successful, I won twice at Bristol Head, won at Nottingham City Regatta, won at Met Regatta and got a place in the senior women’s boat to race at Henley Women’s Regatta where we qualified and won a round. Ten months prior to Henley Women’s, I never expected to achieve so much in such a short amount of time in a new sport. All of this highlighted how much all the hard work throughout the season had paid off and it is so nice to look back at my beginner year with great joy. I am now part of the senior squad and in my second year of rowing. It is a definite step up from training as a beginner but improvements are being made with every training session. This season I have competed at the British Senior Rowing Championships, raced at Kingston Small Boats Head, and also raced at BUCS Head. I love being a part of such a big, but tight-knit squad where we are all routing for one another’s success. 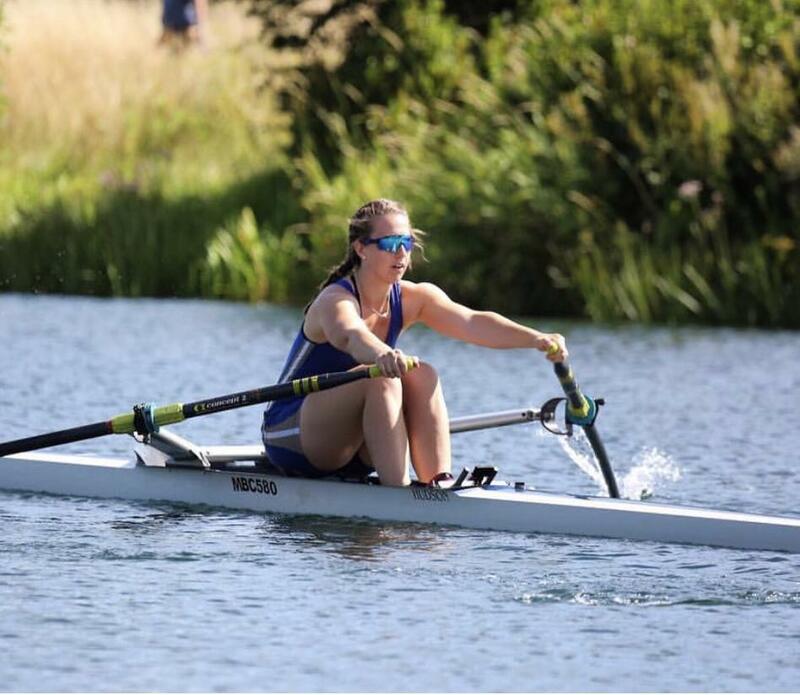 ‘When I started University in 2017 to study Biomedical Engineering, I had never rowed before and just happened to sign up at Fresher’s Fayre. This past year I have raced in BUCS events in a beginner’s 4+, and just missed out on qualifying for Women’s Henley in an academic 8+. It was still an amazing experience and has only made me want to succeed more. Over the summer I learnt to scull and raced at Peterborough regatta after stepping into a single a few days before. One of my highlights this year was attending the British Rowing BUCS camp and competing in the sculling festival in Nottingham afterwards. I’ve also started to do some coastal rowing during the holidays in my home town of Southend as I couldn’t bear to be off the water for too long! My housemates might think I am a little weird for getting up so early and training so often, but it is always worth the hard work and blisters in the end! ‘I started rowing four years ago and have loved it ever since. I competed at several high level junior rowing events including National School’s Regatta, School’s Head, and British Rowing Indoor Championships. When I joined USBC, the quality of training and performance was a massive step up under the coaching of Sam Tuck. I was immediately able to feel part of a high performing and friendly team. I loved my first year at USBC. I was able to train at the wonderful facilities available both at Surrey Sports Park and Molesey Boat Club. The training ensured that I was able to perform to the highest of my ability under the well designed, high-performance programme designed by the team of coaches. In the men’s senior team, we competed and excelled at many prestigious races including Four’s Head, Head of the River, BUCS Head and BUCS Regatta. We ended the season by competing in one of the most famous rowing events, Henley Royal Regatta, in the Temple Challenge Cup. ‘I started rowing one year ago when I joined the University of Surrey for my Business Management degree. Joining USBC was never my intention prior to coming to the university, however after talking to the boat club at the active freshers’ fair I was sure that rowing would be the perfect sport for me to join. Since then I have loved being a part of USBC, training with an amazing team of like-minded athletes and coaches who push you to become better. Even though training sessions are never easy, the hours spent doing so pay off massively when you’re racing against other teams. In the men’s development team we achieved constant top 5 finishes throughout the season, and ended the season off strong by racing in the Temple Challenge Cup at the Henley Royal Regatta. ‘I started rowing in Cornish pilot gigs when I was 12, then switched the sea for rivers and a sliding seat when I started my undergrad degree at Bath. Continuing with my postgrad EngD at Surrey, I couldn’t stay away from the water and signed straight up to USBC. Rowing has always been a big part of my life, and Surrey has only increased my love for it. Training hard and competitive racing gives the chance to keep pushing myself. I was worried the training would be too full on with working full time at my placement sponsor, but it provides a great way to relieve stress and keep focus and organised. What better way to clear your head than on the water? ‘I started rowing when I joined Surrey University in 2016. I came to university with the intention of trying a sport which was new to me and one which would challenge me – rowing is undoubtedly challenging. I have never challenged myself as much as I have done with rowing and there are no boundaries, you just keep pushing yourself until you cannot push any further. Consequently no training session is an easy one but success is never achieved with ease. My first year of rowing has been incredible and has continued to get better as the year has gone on with many good performances and wins along the way. To top it off, at the end of the season we qualified for the Academic 4+ at Henley Women’s Regatta. This makes every stroke on the erg and every 5am training session worthwhile – the feeling of accomplishment I’ve had at each of these events is without a doubt one of the best feelings.